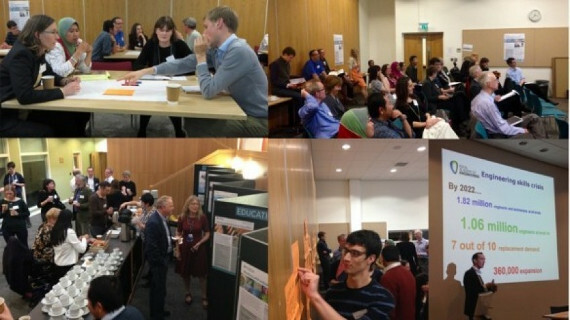 The Manufacturing Industry Education Research Group (MIERG) at the IfM has hosted the 3rd Annual Symposium of the UK & Ireland Engineering Education Research (EER) Network on the 5 and 6 November. A packed programme over 2 days brought together around fifty representatives from academia, industry and the Royal Academy of Engineering (RAE). Professor David Cardwell, Head of the Engineering Department, formally launched the now independent UK&I EER Network which had previously been the EER Special Interest Group (SIG) hosted by the HEA (Higher Education Academy) before support for these and many other activities was withdrawn due to funding cuts. The combination of speakers, discussion groups and paper presentations gave the delegates much to talk about. A lively buzz pervaded in the breaks with talk of research collaborations, innovative practice, the big challenges and major successes. Successes such as the new Engineering Education Centre at UCL and in 2016 a new STEM Education Centre at Aston University. Professor Robin Clark, Chair of the UK&I EER Network, concluded his presentation with a call for the community to build on its now strong foundations, to collaborate, grow and deliver the research evidence that can make an impact.